When you are building rockets, you're most likely going to run into the occasional rapid unscheduled disassembly. It happens to even the most experienced rocket surgeons. You might as well embrace it and take advantage of the opportunity and snag some spectacular photos. 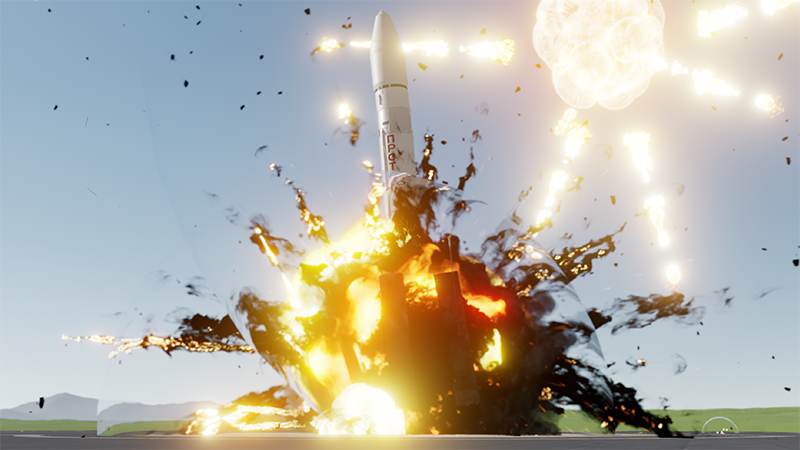 In addition to the visuals, we also improved the physics of the explosions quite a bit. Now larger fuel tanks will create much larger explosions. We also approximate the surface area of parts and use that to determine how much it should react to an explosion. I've spent far too many hours now sitting on the launch pad blowing up parts before realizing that I had long ago crossed the line between working and playing. Don't tell the other devs. Here are some more great shots I got this weekend. And of course, a GIF to make this post look complete. I apologize to the BaconAircraft, Tully, CjrLdy, Shigure, and CoolPeach for blowing up their beautiful crafts. I would like to apologize to everyone for the intermittent outages on our websites. Our service provider is having issues and they are aware of the issue and working on it. Hopefully, they will figure this out soon. Also, I should probably mention something about schedule (I know my fellow devs love when I talk about the S-word). We are not going to be launching in October and we are now most likely going to be launching in early November. Please, don't send me any black licorice. I have already purchased some and will be munching on it soon. Sorry for the slippage, but thanks for sticking with us! We hope it will be worth the wait! Will there be different graphics for the decouplers? SImpleRockets 2 will be rival for KSP? @JetFly That's what I meant by manually deorbiting it. Though, kinetic bombardment would be far better. Wouldn't violate the treaty, either. But that's real world talk, not SR2 talk. @SupremeDorian isn't retrograde burn enough? @JetFly You'll need to manually deorbit the projectiles. I doubt you can deploy a bomb at enough force to deorbit it into Smearth. @AndrewGarrison Hey Andrew will you at launch or after launch have it like KSP so that you need a connection to the Space centre to control a probe so that there is actually a reason for satellites and relay networks. While they said this, If you actually read some of Andrews comments and posts, he said to me it will be next year. I just had a thought, after the release date, will we be able to apply to get the beta version? You know, so we can beta test update before release? But if you just keep the same people from now, people might thinks it's unfair. Thanks, Nm. @MyMessage It should mean "Schedule"
@Voltaia When Jundroo started developing the game, they said right away "both versions for pc and mobile will come out at the same time"
@ocso639 Unless you make a plane with bombs etc. I don't think weapons go well with rockets, maybe a mod will add weapons. @BillyMathewson They are currently working on bugs and other things, but weapons would probably be added some months after the release or they could not be added at all, but SR2 will have a Mod Support, so probably someone would create a mod with weapons.